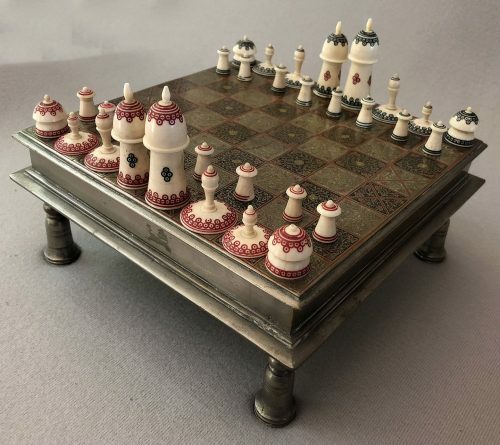 An Antique Muslim Chess Set, Natural Asian Elephant Ivory with incised red and black geometric designs. These beautiful simple shapes evolved in Islamic Society to designate the various chessmen, The design of the pieces have an abstract shape and are designed according to Islamic tradition, where no human figures are to be depicted. Rather, the chess pieces are decorated with tiny circles on their undersides as shown in the images. The King stands 2.4” tall. Included is its original rare Islamic metal chess table, 8.5′ by 8.5″ by 4″ tall. 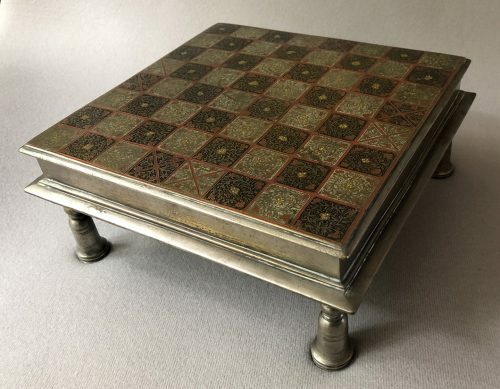 The table top is incised with black and red designs which form the squares of the chess table. The chessmen are in excellent condition. Circa 1890 – 1900.